LOVE LANGUAGES? I do. Russian, French, Turkish, Old Church Slavonic, Serbo-Croatian, Uzbek. They’re tough, but thankfully there’s a formal system for learning so it’s easier to break down and understand a language’s linguistic components. Not so global health. 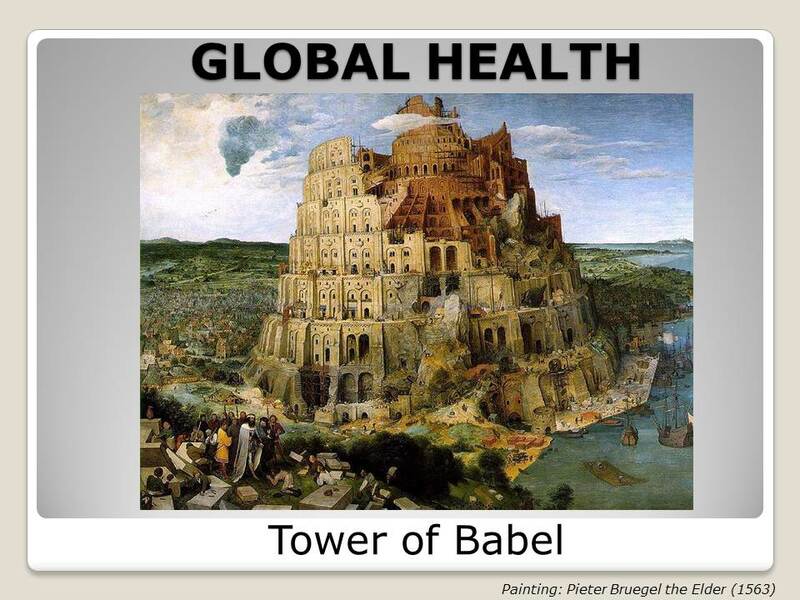 I think the language of global health is akin to the Tower of Babel. What does ‘global health’ really mean? Is it the same as ‘international health,’ ‘tropical medicine,’ ‘public health?’ Why are there so many controversies over simply defining this oh-so-fashionable area of health? In one sentence, a global health professor can talk about “USAID and PEPFAR working with WHO to develop a DOTs program to fight TB, and hopefully improve the DALYs, which are critical to the success of the MDGs.” I’ve dubbed this language ‘Global Alphabet Soup,’ or GAS. Yes, it’s easy to get indigestion, crumbling under a tower of global health jargon. Whew. In short, that means: Global health transcends borders. It involves international collaboration and research through many disciplines and institutions with far-reaching goals: improving health; addressing problems that cause global health morbidity and mortality; and reducing global health disparities. In short, changing the world. 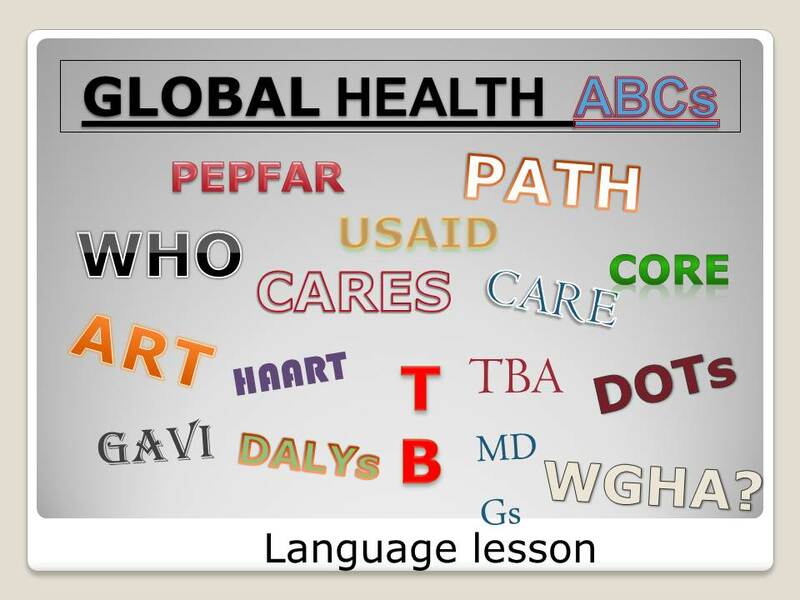 To unlock those puzzling acronyms in this “Language Lesson” slide: PEPFAR: President’s Emergency Plan for AIDS Relief. PATH: Program for Appropriate Technology in Health, based in Seattle. WHO: World Health Organization. CARES: Center for AIDS Research and Education Services. CARE: Cooperative for Assistance and Relief Everywhere. CORE: Centers for Obesity Research and Education. ART: Anti-Retroviral Therapy, for AIDS. HAART: Highly Active Anti-Retroviral Therapy, for AIDS. TB: Tuberculosis. TBA: Traditional Birth Attendant. DOTS: Directly Observed Treatment Short course, a strategy used in treating TB. USAID: United States Agency for International Development. GAVI: Global Alliance for Vaccines & Immunizations. DALYs: Disability Adjusted Life Years. MDGs: Millennium Development Goals. BMGF: ‘Be My Good Friend,’ better known as the Bill & Melinda Gates Foundation, based in Seattle. WGHA: Sounds like a TV station! The Washington Global Health Alliance was founded by former TV journalist Lisa Cohen and based in Seattle. 1. Jeffrey P. Koplan, “Towards a Common Definition of Global Health,” The Lancet, v. 373, issue 9679, pp. 1993-1995; June 6, 2009. 2. Linda P. Fried, “Global Health is Public Health,” The Lancet, v. 375, v. 375, issue 9714, pp. 535-537, Feb 13, 2010. 3. USAID Global Health Acronym List. 4.”The Challenges of a “Common Language” in the Global Health Community,” by Wolfgang Munar and Wendy Prosser, Feb 7, 2012, on Gates Foundation web site. 3. Global Health: An Introductory Textbook, by Ann Lindstrand et al. Copenhagen: Studentlitteratur, 2006, pp. 9-52.